Home » Blog » Proud to be Highly Commended at the Halifax Business Awards! Proud to be Highly Commended at the Halifax Business Awards! Quickslide were shortlisted in this years prestigious Halifax Business Awards in the ‘Manufacturing Business of the Year’ category. To be shortlisted we had to demonstrate a modern and efficient approach to manufacturing and marketing, with a commitment to continuous excellence in product development and customer service. The judges were also looking at our strategy to reach new markets, and improve reach within existing ones. With our commitment to research and development, and a sound track record of training and passing on vital skills to new generations, Quickslide was a very impressive candidate in this year’s awards. 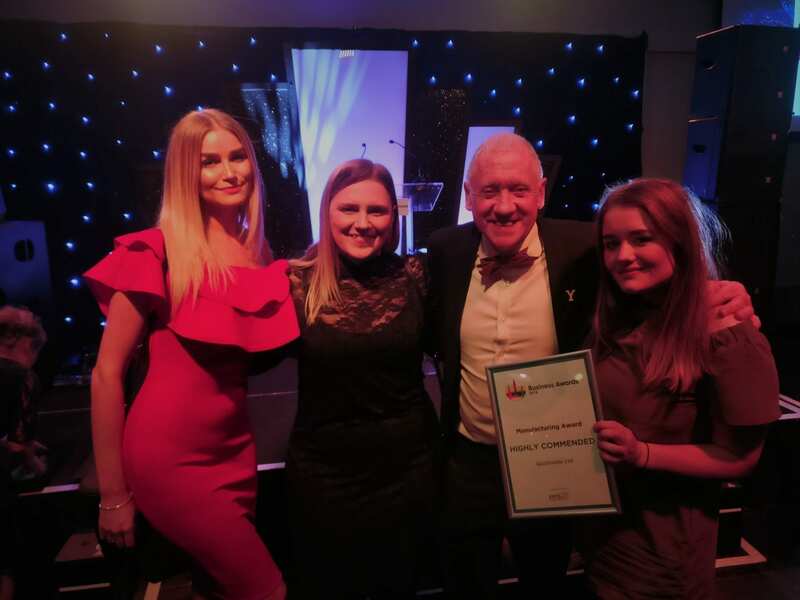 Our Marketing duo Sandra and Charlotte and Account Manager, Jovita went along to the awards evening on Friday the 16th at The Venue in Halifax to receive a Highly Commended certificate. To be highly commended is a great pat on the back and it goes to show that while the number of windows we make is important, it is not as vital as how we run our manufacturing business. We’ve certainly served our apprenticeship through more than 15 years of hard work by all involved. Almost everyone who started with the business is still with the business. This speaks volumes about the way Quickslide is run; honestly, self-effacing, constantly learning and always with great passion. Our philosophy of ‘you win some and you learn from some’ means that even though we didn’t get to leave with the biggest trophy we’ll keep up the hard work and strive for the gold next year! More importantly, the Quickslide girls had a lovely time at The Venue being entertained by the evening’s host, the BBC television presenter Harry Gratio.